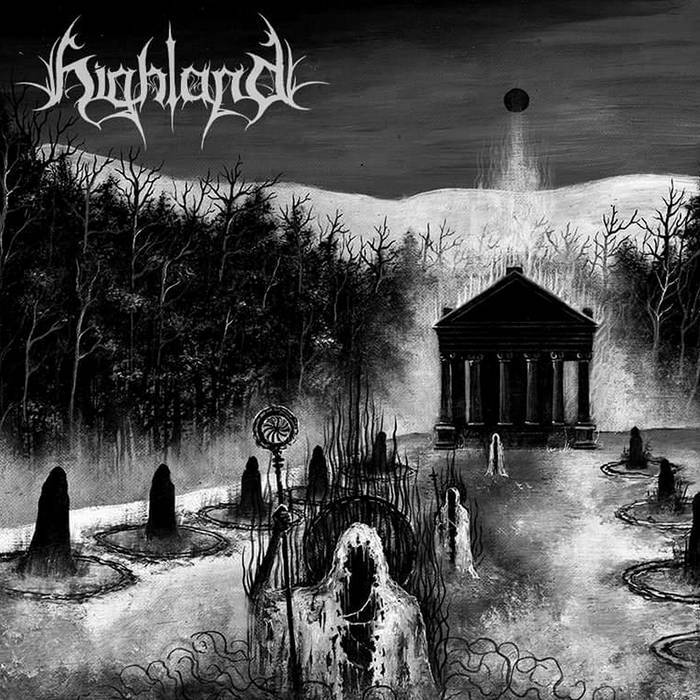 For all it may lack in the traditions and anarchy of the Norwegian scene, the American black metal scene has some incredible musicians in it. Highland are the newest addition, releasing their debut full length ‘Loyal to the Nightsky’ in May via Bandcamp. This is some exhilarating black metal for traditionalists, with relentless riffing from start to finish. From the use of the word ‘Nightsky’ in the album title, you may think that you’Ll be getting some kind of Emperor knock-off here, but that is certainly not the case. Highland may lack the grandeur of Emperor but that in no way means that they lack the finesse. They are visceral and almost early Satyricon like in their execution. Take the savagely direct ‘Towards the Absolute’ as example; cold buzzing riffs swirl around combinations of blasting and more straightforward drumming, while a scathing yet easily comprehensible snarl leads us onward. There are more gloomy tracks too, where the bile is toned back a bit, like parts of ‘Abu Sindi’, or the intro to the dark ‘Immortal Queen’. The menacing ‘Burning in Forgotten Times’ is my highlight; a bleak crawl into the void with some doomy riffs (rad Iommi-isms) and a overwhelming negativity about it. But you could take most of the songs here and find purest second wave worship of the highest order. Like a more waspish Marduk, or Impaled Nazarene, Highland show that the USBM scene isn’t just atmospheric sky staring, but there is a bleak, cold and ruthless set as well. Feel the icy rage of ‘Wallachian Night Terror’ and tell me I’m wrong. Wow, amazing blog layout! How lengthy have you been blogging for? you make blogging look easy. The full look of your site is magnificent, let alone the content material! you are really a excellent webmaster. The website loading speed is incredible. It sort of feels that you are doing any unique trick. In addition, The contents are masterpiece. you’ve done a great job in this matter! whoah this weblog is wonderful i love studying your articles. Keep up the great paintings! You understand, a lot of persons are looking around for this information, you can help them greatly.